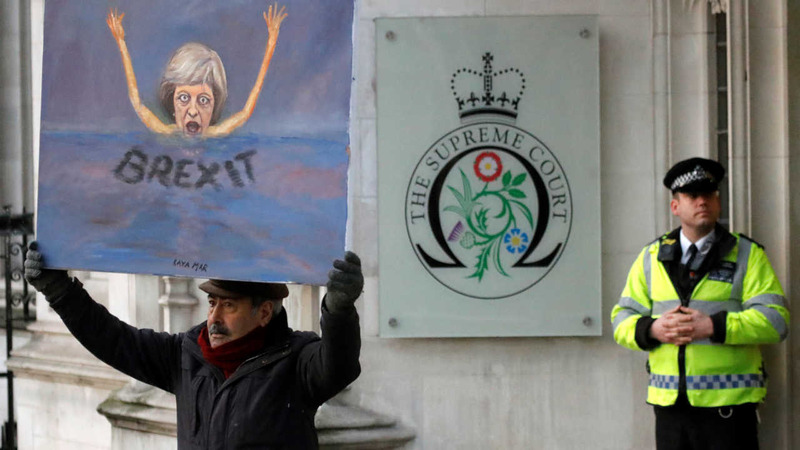 LONDON -- Britain's government must get parliamentary approval before starting the process of leaving the European Union, the Supreme Court ruling Tuesday, potentially delaying Prime Minister Theresa May's plans to trigger negotiations by the end of March. The ruling forces the government to put a bill before Parliament, giving pro-EU politicians a chance to soften the terms of Brexit - Britain's exit from the EU. "Leave" campaigners had objected, saying Parliament shouldn't have the power to overrule the electorate, which voted to leave the bloc in a June 23 referendum. May had said she would use centuries-old powers known as royal prerogative to invoke Article 50 of the EU treaty and launch two years of exit talks. The powers - traditionally held by the monarch -permit decisions about treaties and other issues to be made without a vote of Parliament. "The referendum is of great political significance, but the act of Parliament which established it did not say what should happen as a result, so any change in the law to give effect to the referendum must be made in the only way permitted by the U.K. Constitution, namely by an act of Parliament," the president of the Supreme Court David Neuberger said in reading the judgement. "To proceed otherwise would be a breach of settled constitutional principles stretching back many centuries," he said. May had argued the referendum gave her a mandate to take Britain out of the 28-nation bloc and that discussing the details of her strategy with Parliament would weaken the government's negotiating position. The decision doesn't mean that Britain will remain in the EU. But it could delay the process. "Today's result comes as a surprise to no one. Unfortunately for businesses and other institutions, Brexit still means uncertainty," said Phillip Souta, head of U.K. public policy at Clifford Chance. "Parliament remains divided and the outcome of the negotiations remain unknown." Legal experts suggest that May's government will introduce an EU bill quickly and keep the scope of the legislation narrow - focusing solely on triggering Article 50 - in order to limit the chance for amendments that could delay a vote. However, the bill could still be subject to delay in the unelected House of Lords. "Defeat in the House of Lords would not stop Brexit from happening, but it could delay it until mid-2020," Souta said. Miller, who founded SCM Direct, an online investment manager, had argued the case wasn't about blocking Brexit. Instead, she said, it was about "democracy" and the "dangerous precedent" that a government can overrule Parliament.